Zune Thoughts: The Zune HD is Dead. Long Live the Zune HD! The Zune HD is Dead. Long Live the Zune HD! There have been a few updates in the world of Zune over the past week or so. First, Microsoft has discontinued Zune Originals. That's right, no more custom Zune HDs are available for order. I did a little eye-roll when this happened, because I wanted a 64 GB Zune HD but was waiting for the price to drop a little more. Looks like I waited too long! 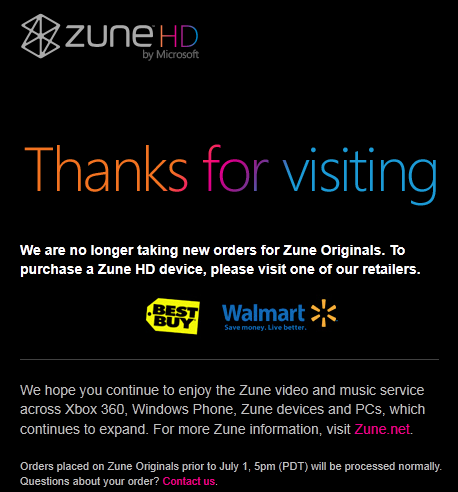 The Zune Originals Web site says to go look for a Zune HD at Best Buy or Wal-mart, but good luck with that. Zune all but died at retail a long time ago. Lastly, there's software update for the Zune HD that takes it from 4.5 Build 109 to 4.5 Build 114. I have no idea what it adds or changes, because Microsoft doesn't release changelogs about the update. It baffles me as to why Microsoft continues to release apps for a product they've ignored and marginalized in an epic way. I mean, what's the point?